The Diamond Force penalty kill formation allows fairly static coverage by two players and dynamic coverage by the other two players. D2 covers the goal mouth and low slot while D1 plays the Strong Side and may move out to pressure the pass or the puck carrier. 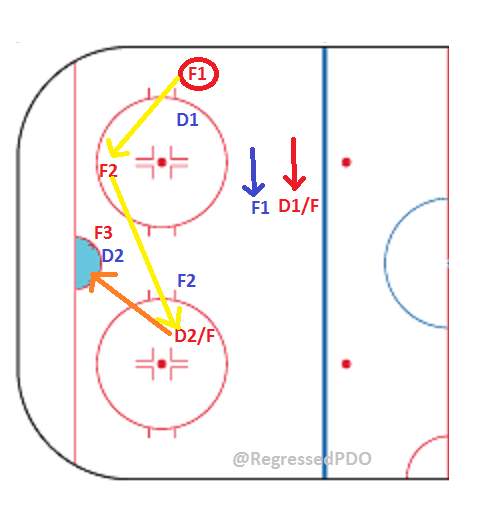 F2 covers the Backside options while F1 plays the Strong Side options higher in the zone and moves laterally with the movement of the puck high in the zone. Chicago has switched between an Umbrella formation and an Overload formation in the playoffs. The Overload has proven more successful for Chicago. Toews’ second goal of Game 7 versus the Anaheim Ducks in the Western Conference Final came from an Overload formation on the Power Play. There are many options for setting up shots in Overload formations. The goal Toews scored came from a Half Boards Shot option. 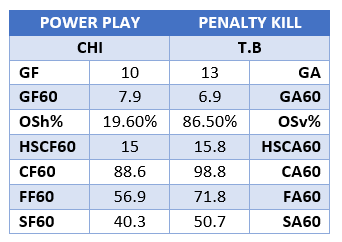 Chicago uses 4 forwards and 1 defenseman on each power play unit almost exclusively. Brad Richards and Patrick Sharp have served in roles traditionally filled by a defenseman on the power play. The Half Boards Shot option is shown in the diagram. Other options include setting up a shot from D2/F (backside), D1/F (strong side), interchange options and plays for shots low in the zone. When we overlay the power play and penalty kill formations, we can get a better idea of how they will match up on the ice. In reviewing some footage of T.B’s penalty kill, D1(blue) is particularly aggressive in challenging F1(red), coming far from his “home” position to pressure. Given that both Toews and Kane play F1 & F2, there is potential for exploiting that aggressiveness from D1. On the other hand, D1 is often played by Victor Hedman for T.B. Hedman is not only a good skater with terrific size, but he has really honed his skills with his stick and frequently separates the puck from the puck carrier with a poke check. F1(blue) has been played by Brian Boyle who is very aggressive at penalty killing and who, because of his size, has a long reach and can disrupt passes well. Once the penalty killers start moving to pressure the puck, F1 will need to make quick decisions as the “quarterback” of this power play formation. This need for making quick decisions, reading the coverage well and using deception to mislead the penalty killer makes Toews and Kane excellent candidates to play F1 and F2 on the first power play unit. 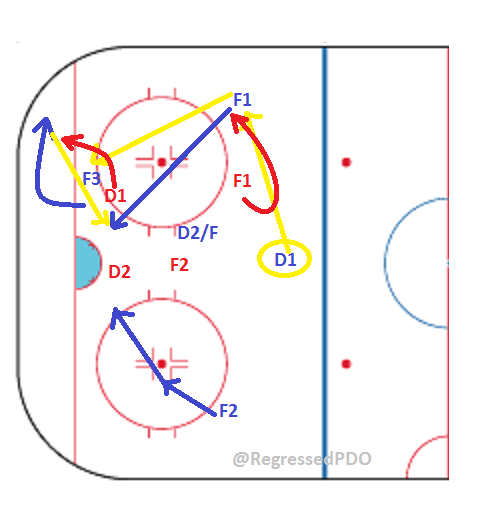 In the play at the right, F1 gets the puck and draws D1(blue) out toward the boards while hinting toward going high in the zone with the puck or with a pass to D1/F. 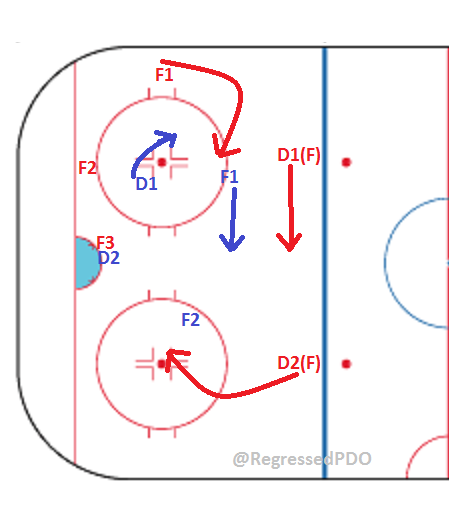 As D1(blue) moves out to pressure, F1 passes to F2 who has moved to a position low in the faceoff circle. D2/F slides down behind F2(blue) to receive a pass from F2 and one time a shot on goal. 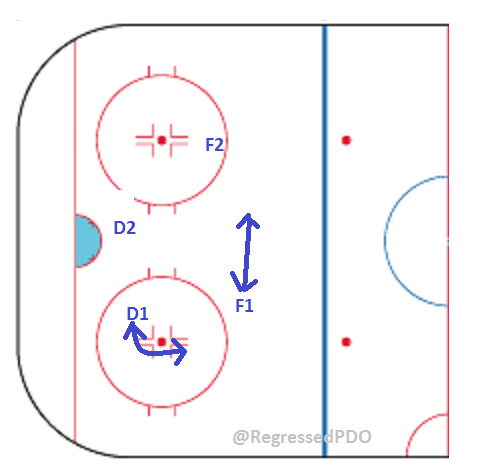 The movement on the other side of the ice may, and often does, pull F2(blue) further toward the middle of the ice opening up a passing lane through the slot. As I mentioned above, the Overload provides many different options to set up shots so this is just one possible option to take advantage of the movement by the penalty killers in a Diamond Force formation. Unless a team scores pretty quickly, at some point during a power play, the puck is cleared out of the zone. The team with the man advantage then has to regroup and try to get into the offensive zone again while the penalty killers set up the neutral zone foreceheck to keep that from happening. Tampa Bay uses a fairly passive neutral zone forecheck on the penalty kill. One T.B penalty killer pressures the breakout and retreats into the neutral zone to pressure the puck carrier and passes in the middle of the ice. This forechecker does not stray far from his mid-ice position unless directly challenged. His 3 teammates spread out in the neutral zone retreating back into their defensive zone as the play advances in one of the wide lanes. 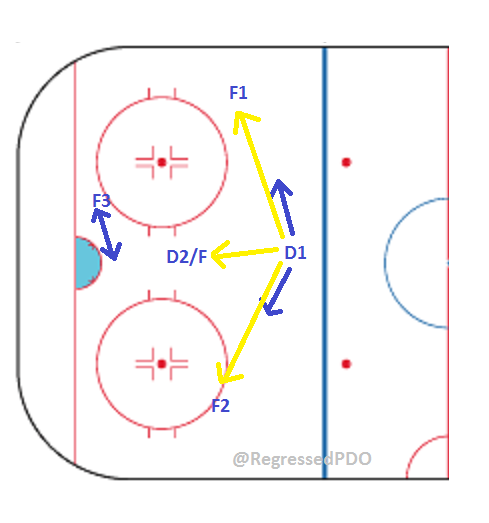 The 3 man forechecking unit shifts toward the wide lane being used by the oncoming players. The player closest to the puck carrier releases from his position and presses as the puck gets into the attacking zone. This system essentially allows the attacking team to enter the zone through one of the wide lanes and then uses the boards to help stifle the attack. If the puck carrier comes through the middle of the ice, the three players back hold their positions and disrupt passes or attempts to carry the puck. 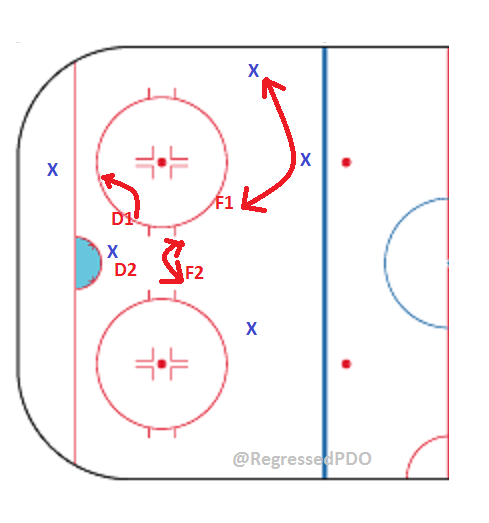 Chicago uses any number of breakout plays to enter the zone on the power play. Most involve a defenseman or the forward acting as a defenseman bring the puck up to his blue line or over it and choosing his passing target from the options moving in the neutral zone. The puck carrier will have two options wide, an option up the middle and often an option cutting from one side of the ice to the other as well. 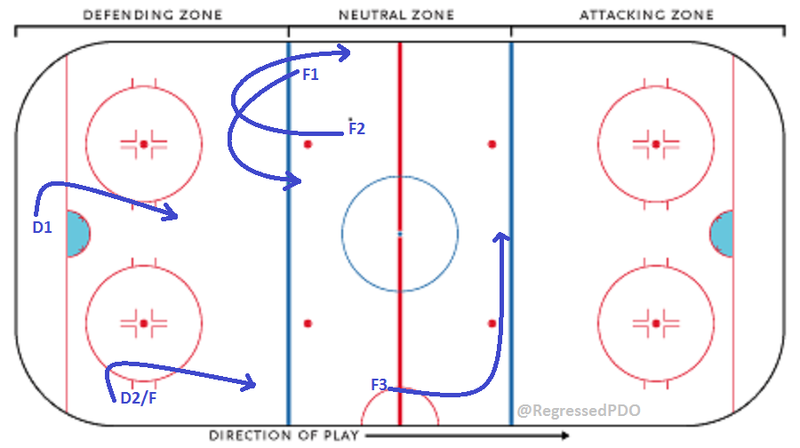 Chicago also uses a drop pass play to gain the zone on the power play. Most frequently, this involves D1, either Brent Seabrook or Duncan Keith, skating the puck to the red line with forwards moving up the boards wide with speed and a third forward cutting across the ice high in the neutral zone. Patrick Kane starts in the neutral zone but swings back behind the puck carrier as the others build speed toward the attacking zone. 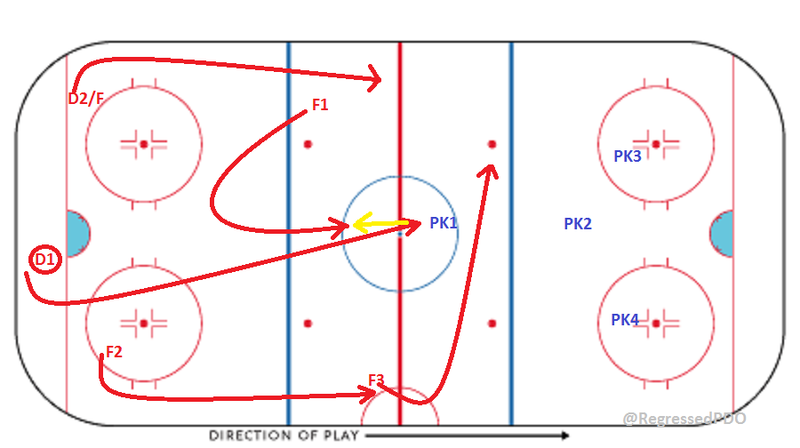 Against T.B’s 1-3 forecheck, D1 collects PK1 in the middle of the ice as he makes the drop pass to F1 thus making the entry a 4 on 3 situation with the penalty killers retreating back into their zone and trying to read the play to see where the puck will be coming from. F1 now has the option to pass to his teammates on the entry or carry it in himself. The potential for confusion among the penalty killers is great on this type of play, because there is so much movement that makes it difficult to read the entry. Of course, this is just one example of how these plays match up and Chicago has a lot of options on zone entries due to the personnel carrying them out. 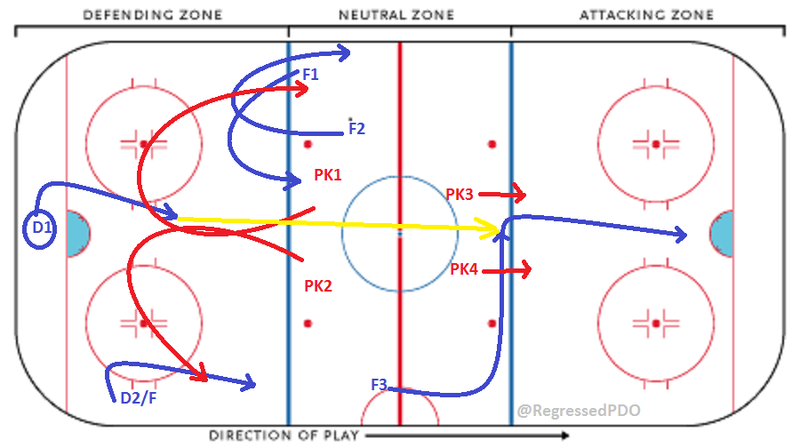 Chicago uses a penalty killing formation called a Czech Press or Wedge +1 that essentially is a triangle of players protecting the net and the slot with an additional forward (+1) pressuring the puck carrier or pass high in the zone. D2 covers the net front while D1 plays the strong side (i.e. where more players are down low on the overload). D1 does not stray far to pressure the low forward unless he is confident he can get the puck free from the carrier. F1 plays the pass between the players on the strong side high. F2 covers the slot while constantly keeping tabs on the backside option. If the overload shifts to the opposite side, F1 and F2 switch duties. F2 covers the pass while F1 covers the slot and the backside option. D1 and D2 make the same switch as F1 and F2 to cover the players low in the zone and the net. Tampa Bay has used a 1-3-1 power play formation fairly often during the playoffs. Tampa Bay’s power play involves a lot of movement and passing meant to stress the penalty killers and force them to lose coverage (as with any power play). They also use 4 forwards and 1 defenseman on the power play. Steven Stamkos often plays the role intended for the second defenseman in this power play scheme. Anton Stralman is used as D1 and quarterbacks the power play from the blue line. The 1-3-1, when well executed, can be very effective against a Czech Press penalty killing formation. In the play seen above, D1(blue) passes to F1(blue) while F1 pressures the pass. F1(blue) passes to F3(blue) low in the zone. 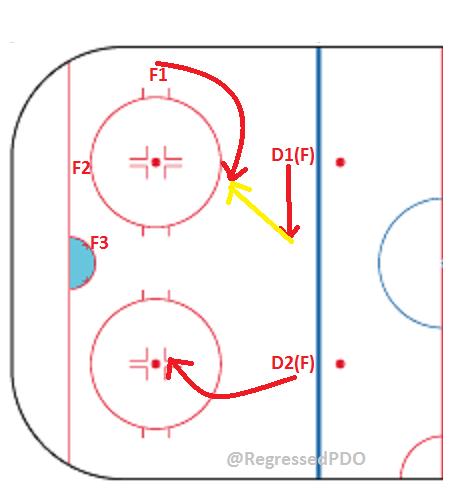 F3(blue) skates the puck toward the corner drawing D1 with him. At the same time, F1(blue) and F2(blue) drive toward the net. F3(blue) passes back to F1(blue), but the movement of F1(blue) and F2(blue) forces D2 to make a decision. If he plays the puck carrier (F1), that will leave the pass to the backside option (F2) open. If he plays the pass to avoid the backside option from being used, then F1 will likely take a shot. It is frequently held that D2 should play the pass as the backside option will be much harder for his goalie to adjust to and allow the goalie to face the shooter on his own. 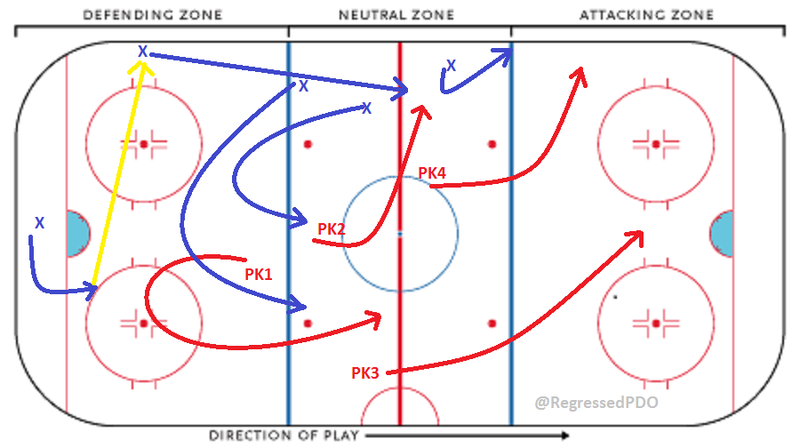 Once the puck is cleared from the zone, the power play team must figure out a way to get back into the attacking zone. Chicago has been quite aggressive defending zone entries while killing penalties. In there series versus Anaheim, Chicago ran a variation of a Tandem Pressure neutral zone forecheck against Anaheim’s power play breakout. Anaheim would stack three forwards in the neutral zone on the same side of the ice and then when the puck carrier started moving from behind the net, two of the forwards would swing down and out wide to give options across the ice to the players bringing the puck out of their zone. One penalty killer would start out in the opponent’s zone to pressure the puck carrier stationed behind the net. The puck carrier passed to the nearest player on the boards as the forwards in the neutral zone swung down and out into the mid-ice and wide lanes. 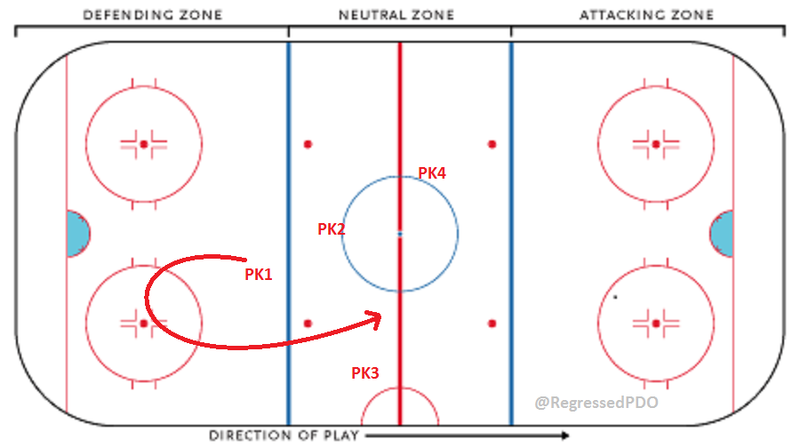 PK1 backchecked into mid-ice in the neutral zone while PK2 covered the puck carrier, driving him toward the boards. Both PK1 and PK2 worked to take away passing lanes as this went on to force the puck carrier to keep the puck. PK3 worked his way back to the slot to cover the net while PK4 helped seal off the wide lane and boards. This system often forces the puck carrier to dump the puck into the zone where he and his teammates will have to work to retrieve it. Tampa Bay, like Chicago, has some interesting options through the neutral zone on their breakouts because they have good passing and puck handling. 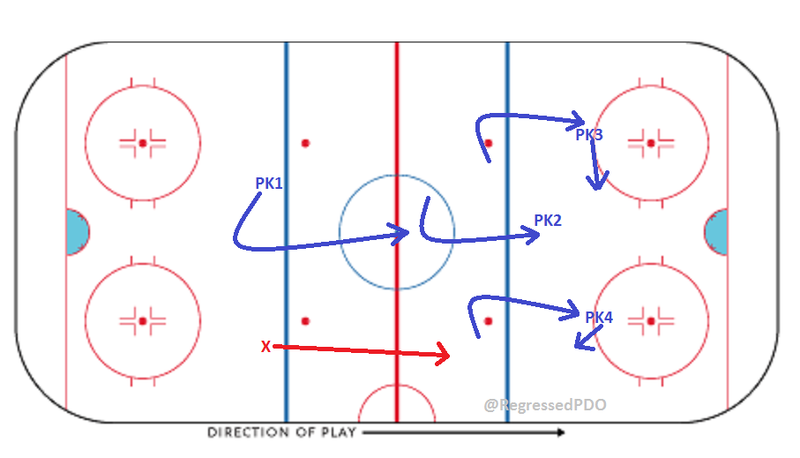 There are many moving targets in this kind of breakout with the exception of the player at the half boards, who remains in place until D1 makes a pass or starts to carry the puck up past the faceoff dots. F1 and F2 create movement and build up speed by swinging down into the zone and crossing on their way into the neutral zone. F3 starts toward the attacking zone and then crosses along the blue line to provide another target and maintain speed. The New York Rangers used a Forwards Wide neutral zone forecheck against this breakout during their playoff series. Below is a diagram of how Tampa Bay took advantage of that. The Forwards Wide formation the Rangers used works to take away passes to the targets in the zone and those moving into the neutral zone. The goal with this is to force D1 to make a bad pass or skate the puck out of the zone where PK3 and PK4 are waiting to meet him. Tampa Bay countered this by using a good passing defenseman as D1 and having F3 in the neutral zone on a path that took him in behind PK3 and PK4 at mid-ice. D1 skated about halfway to his own blue line and hit F3 straight up the middle with a pass. F3 could then drive the net unimpeded. 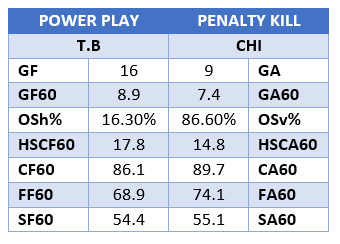 Because Chicago uses a variety of neutral zone forechecking schemes on the Penalty Kill, we do not yet know how exactly this will look against Tampa Bay, but we can be sure that whatever formation Chicago uses, it will be aggressive. Likewise, because Tampa Bay has options when it comes to the Power Play breakout, we can only make some educated guesses at what they will run, but we can be certain that it will involve a lot of movement to find the holes in coverage.